Norden Crafts: EXCLUSIVE LIMITED EDITION PREMAX SCISSOR - PRE-ORDER NOW!! EXCLUSIVE LIMITED EDITION PREMAX SCISSOR - PRE-ORDER NOW!! Santa's Elves have been working very hard this year to bring you an EXCLUSIVE LIMITED EDITION PREMAX SCISSOR available for the upcoming holiday season! We are now accepting pre-orders on this fabulous 3 1/2" Embroidery CANDY CANE SCISSOR! 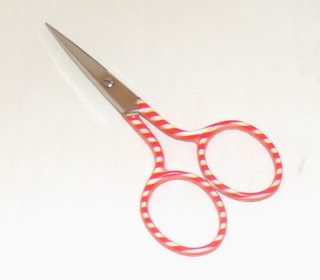 Quick, contact your shop and let them know that you want the Premax Candy Cane Scissor! Don't miss out, when they are gone, we won't be able to get any more! Norden Customers - Click the link below to order it now!